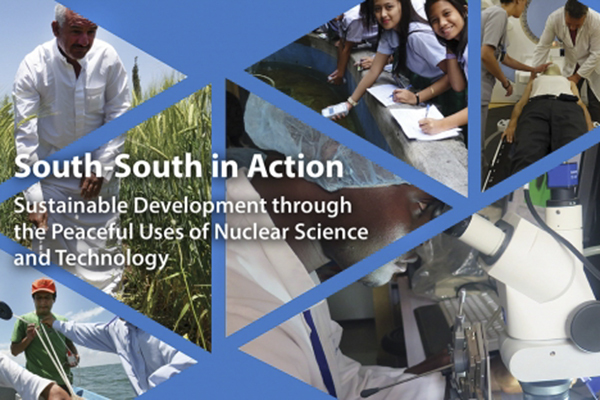 The IAEA has launched a report showcasing how the application of science and technology through cooperation among developing countries is helping countries achieve their development objectives. Examples highlighted in the report include combatting diseases such as Ebola and identifying the presence of clean water in arid regions of Africa. The report, a joint initiative with the UN Office for South-South Cooperation which forms part of the South-South in Action series, was launched in Buenos Aires, Argentina, at the Second High-level United Nations Conference on South-South Cooperation taking place this week. South-South cooperation is defined as an exchange of knowledge and resources in the political, economic, social, cultural, environmental or technical domain between developing countries. Triangular cooperation involves two or more developing countries in collaboration with a third party, typically a developed-country government or multilateral organization, contributing to the exchanges with its own knowledge and resources. As an example, the IAEA has supported developing countries in combatting diseases that can spread from animals to people, such as Ebola and avian flu. The IAEA’s rapid response contributed greatly to the global efforts against the Ebola outbreak, and the use of regional networks in Africa – a concrete example of South-South cooperation – to share epidemiological information obtained through the use of rapid and accurate nuclear and nuclear-derived analytical techniques was key to the success of the project. Studying the availability of drinking water is another area where developing countries cooperate in the use of nuclear-related technologies, such as isotope hydrology, to find, assess and map groundwater resources. The IAEA has helped countries in the Sahel region of Africa to work together using such technology to study the main transboundary aquifers in the region and the interaction between different water bodies. This has enabled the assessment of the vulnerability of groundwater to pollution, and the impact of climate change on water availability. The result of this cooperation led to the preparation of an overview, for the first time, of groundwater characteristics in the entire region. This will now enable policymakers to make evidence-based decisions on the use and protection of water resources. “The impact stories in the publication illustrate the extensive experience of the IAEA in leveraging South-South and triangular cooperation mechanisms in a flexible and tailor-made manner, focusing on adding value to its activities in support of Member States development priorities and seizing opportunities to build on and expand existing capacities and networks,” Mr Krause said. The report highlights the important role of regional cooperative agreements – the Cooperative Agreement for Arab States in Asia (ARASIA), the African Regional Cooperative Agreement for Research (AFRA), the Regional Cooperation Agreement (ARCAL) and the Regional Cooperative Agreement for Asia and the Pacific (RCA) – in helping to coordinate and strengthen learning and exchange among countries of the global south and IAEA assistance to these regions.